You don't have to be a clean freak to want to keep your assembly areas glue and stain free. 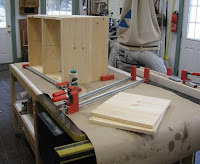 I saw this in a friend's shop and decided to add it to the outfeed table on my table saw. 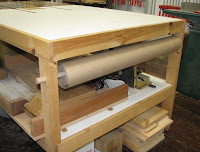 It's just a roll of craft paper suspended on a dowel beneath the work surface but it saves clean up time whenever I glue up a project. 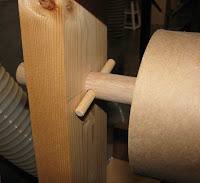 A small dowel pin keeps the large dowel, which can only be removed from one side, from falling out of the shallow hole in the opposite leg of the outfeed table. And it's inexpensive, because I reuse the same area of paper until it becomes badly tattered from too many glue ups that turned into sticky situations.